It has been a long time since I used a system such as DocBook. When writing Pragmatic Augmented Reality I used the Pragmatic PML framework, which is essentially a simplified version of DocBook. Currently, I only want to set up DocBook to publish HTML--I may be adding PDF later. Finding the installation and set up instructions for DocBook on Windows was not easy. I discovered a couple of old (and short) versions of this and that's where I started. 1. Unless you're using a tool that supports DocBook (such as XMetal), you'll need to use one or more of the DocBook schemas. 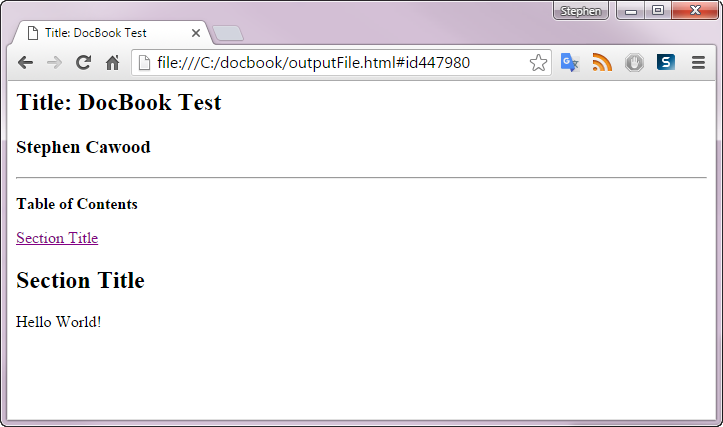 To do this, download and unzip the DocBook XML 5.x.x DTD from: http://docbook.org/schemas/5x.html. This is optional since the stylesheets reference web versions of the DTD by default and you can edit DocBook files in any XML/text editor--I prefer Sublime Text because it's cross-platform and awesome. B. LIBXML2: I downloaded libxml2-2.7.8.win32. ftp://xmlsoft.org/libxml2/win32/64bit/, or ftp://xmlsoft.org/libxml2/win32/. But I'd try to get the old one working first. I haven't bothered to upgrade. D: ZLIB1: I downloaded zlib-1.2.5. And the successful output should like like the image below. Note: If you want to build PDFs, you'll need to download and install FOP for Windows.